Bible College level classes at a pace you can handle and a price you can afford! These classes are taught by local pastors. Grades recorded and kept in permanent files. Students are only responsible to purchase their textbooks. The program is designed to last two years on location in Mattoon, Illinois. Any students that would like to go to the mission field are encouraged to complete their training with a 9- month intensive missionary boot camp in Bowie, Texas at the Baptist Bible Translators Institute (www.baptisttranslators.com). A Certificate of Completion is offered with each course. 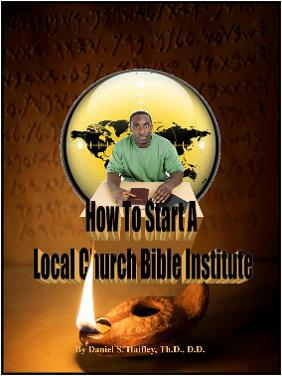 As a service to other local churches we have produced a manual to help you start your own local church Bible Institute. It includes copy-able record keeping sheets for your files, and a copy-able sample catalog. The program is adaptable to your church setting and we are available to help you shape it to your situation.